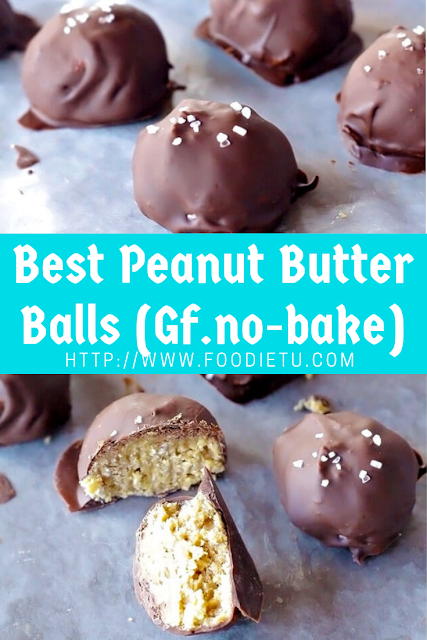 An easy no-bake recipe for peanut butter balls using healthy ingredients like dark chocolate, an unrefined sweetener, and coconut oil to create a delicious and satisfying treat with WAY less sugar than the traditional holiday recipe! It’s also gluten-free and vegan with an easy grain-free option. In a mixing bowl, stir together the peanut butter and coconut oil. If your peanut butter has a layer of oil on top when you open it, just grab a long butter knife and give it a stir until it’s all incorporated again. Likewise, if the coconut oil is rock solid, pop it under the broiler for 30 seconds or so until it starts to soften. Next, measure in the maple syrup. Grab the oats and use a food processor or blender to pulse them 3-4 times until they’re broken up and a finer texture, then stir them into the peanut butter mixture. If you’re using oat flour you can omit this step. Pop the mixing bowl into the freezer for 15 minutes to firm up. This makes it easier to roll out the “dough” into balls. After the brief respite in the freezer, pull out the peanut butter mixture, grab a large baking sheet, and line it with parchment paper. Using a spoon or mini-scoop, measure out small portions of the peanut butter and roll it into balls until you’ve used up all up. Pop the baking sheet of peanut butter balls back in the freezer for 30 minutes to firm up (they should be pretty warm at this point from the heat of your hands and we want them to be cool when we dip them in chocolate). In the last 5-10 minutes of freezing time, fill a small saucepan halfway with water and set it to medium-low heat. Place a large ceramic or metal bowl on top (we’re creating a makeshift double boiler) and pour in the chocolate chips. Give them a stir occasionally for the next few minutes until they’re completely melted.